Can never miss with Fuente. Hits all the marks. the rich pleasant taste of this cigar, the even burn and draw is in my opinion the best smoke I have personally had. ...and the cost does not break the bank. this cigar for the price is much better than the less expensive and better than the more expensive. it burns evenly, draws easy and tastes rich and mellow with a mild after taste. you know you smoked a very good cigar after smoking this cigar. I go through a box a month easily. You cannot beat the Arturo Fuente lineup. Always a perfect roll that delivers a consistent draw and great Dominican flavor. Mild, smooth, even burn. Never leaves a taste in your mouth. Best cigar ever...for me. 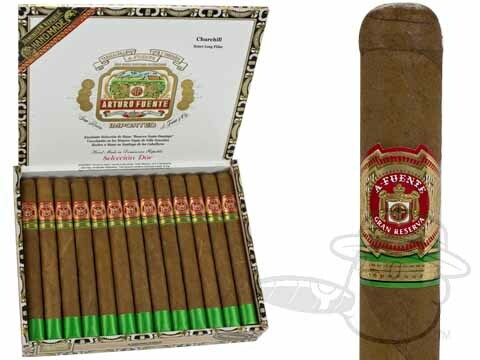 Arturo Fuente Churchill Shade Grown is rated 4.7 out of 5 based on 5 customer ratings.